I've located a pegmatite vein on the farm this summer and it a little hard to get to, my question is to you who have experience in finding pockets in veins. Is there any clue as to whether a Pegmatite may have a pocket with gems before you spend a lot of time digging ? 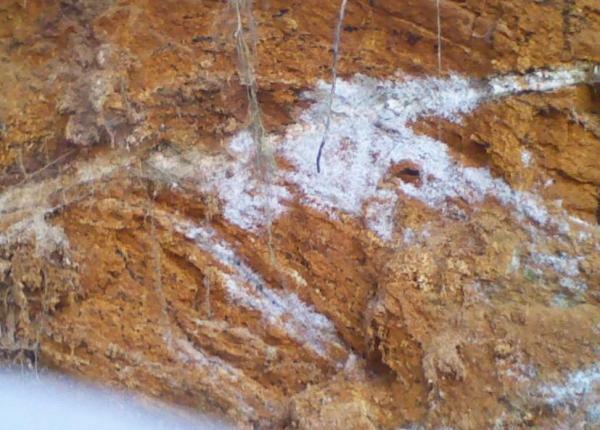 This particular vein is very weathered and soft in a red clay bank. If you have knowledge that would help, let me know before I shift my emphasis away from looking for rubies, I would like to find an emerald, I'm under the impression that they are sometimes found in pockets in pegmatite as welll as other gems, if I'm wrong on this thinking, tell me. granitic, mafic, and ultra mafic pegmatites can be, and many times are, very good sources of valuable corundum, tourmaline, beryl, all the different quartzs, and even garnets, and topaz. So yes, it might be well worth it for you do " a little more diggin" so to speak, on that vein or sill as it may be, go for it bro. I look for rusty streaks, cracks, moisture, seeping out, Look for trees bigger than normal, growing in a straight line. When you re getting near a pocket the minerals making up the pegmatites get bigger. Thanks Guys, Rockhunter 1620 there is an ultramafic body show on a geological map in the immediate vicinity and I think this may be why I have so many different minerals on the property, not too far from this vein is a big rock outcrop which is covered with small red garnets, largest maybe the size of a pea. Deer season will end here Sat. and some hunters have the adjoining property leased and this is not too far from the property line so I will possibly dig in it some after that. Gilaoro I haven't seen any water seep from this vein but I've not been there much yet, there is a smaller vein in a different location that I may or may not have posted some pictures of months ago that I'm not sure if it is a quartz vein or a pegmatite vein it is in a sidewall where apparently they hydraulic mined and in wet weather it will seep water. I've dug some in it but haven't found any gold yet. I know for a fact it contains quartz & feldspar and some mica but it's appearance is not as obvious as the other pegmatite and it has such a dip, I would probably need a machine to follow it. When I was in Arizona, I heard about a find of massive beryl crystals some place in the Weaver mountains. The value was supposedly around $60,000. I used to run around all throughout that area but never saw any outcroppings of pegmatites. Now if you go look in Weaver creek, you'll see some boulders with mostly coarse grains of pegmatite in them but every now and then, you'll come across one with really large crystals. I went all the way upstream and off the sides of the creek looking for the source but could never find it. I don't know how large your property is or if you even have a creek on it but you might want to check and see what you have if you do. Hopefully I will attach pictures of pegmatite vein, smaller pictures were early on and larger ones from yesterday, after quite a bit of digging. Have found no gems but it really is educational and interesting seeing how the minerals form lines and then interact with each other. Worried about overhang above head so have backed out a little for safety and digging down instead of up. Did start finding small quartz pieces inside of feldspar. Lanthanides! The new gold! Monazite sands and rare earth elements! It is the wave of the future and we are gearing up in New Mexico to supply the world! (China just shut the world off from the only supply). All that glitters ain't gold Cheekako. You gotta look for that monozite in the pegmatite and you will have more gold in your poke than a copper miner! Bob: Haven't thought about looking for monazite in the pegmatite maybe that is some of the yellowish material, I have found it on the farm in other places. 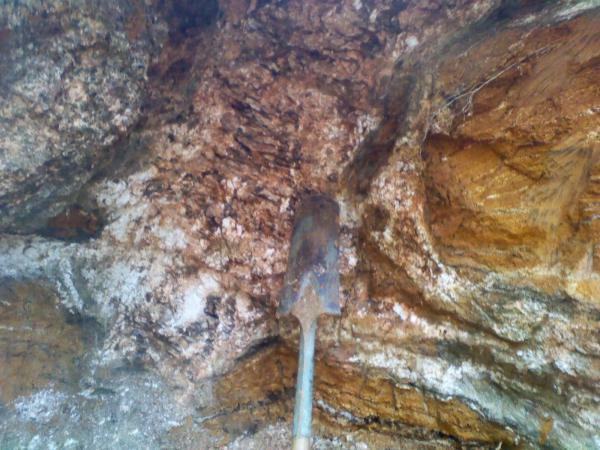 Lots of mica, blackish and pink material in the vein. The sands are heavy and easily seperated from the deletrious material. Monazite is rich in REE's and sometimes VERY RICH. 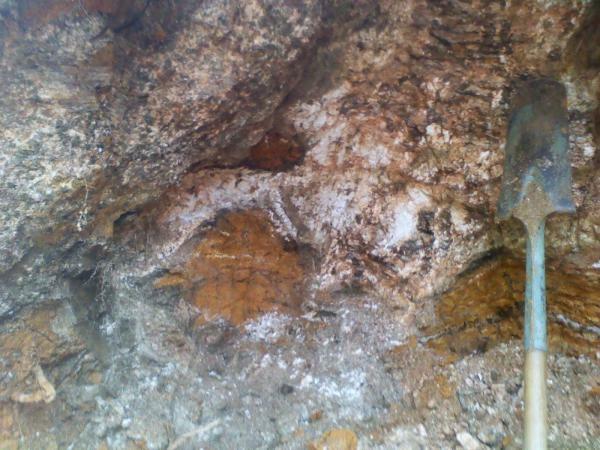 The crystals are as big as your fist in Elk Mountain pegmatite and in my stomping grounds near Tecolote. If the pegmatites have eroded and left the more durable monazite sands in quantity you can just scoop it up and it is "marketable". The time is right for development as there will soon be buyers for monazite sands and there is already stockpiles being amassed. Keep your eyes open for the elements that technology needs and you will make more sheckles than hunting for gold. All rich veins are worth SOMETHING. It is too often that the prospector is oblivious to what that something may be. Just my two pounds of neodymium to add to the disccussion. Thanks Bob will start paying more attention to that, thes monazite I've found in the past has been small about the size of sand or a little larger. All it takes is a high percentage of that sand in the surrounding alluvium and you are on your way. It is a very common constituent in pegmatites but if you are identifying it at all it may be worth exploring the abundance of those sand sized particles and their composition. Good luck! It is the prospector's new heyday! You might want to check with your state geology dept. They have all kinds of information on the geology and economic mineral deposits in your area. Thanks all for the info: Will try to answer some questions and make some additional comments. 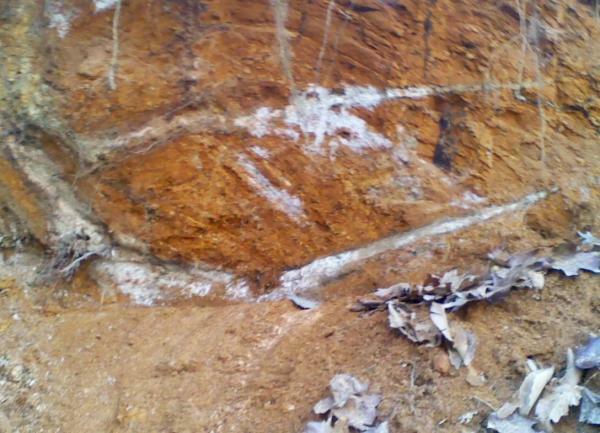 There is no water in the pegmatite which is on the side of a gulch or gulley, however at the base of the pegmatite in the gulch just a few feet below the peg a stream begins and flows and gets bigger and is the source of water for a horse pasture and then flows into a larger creek on the property. There so far has been no gold from the vein, have panned a couple of times. The most unusual thing so far is a couple of larger pieces of feldspar that I took home and soaked in Super Iron Out overnight and the feldspar then became really white and had a beautiful green band around both pieces, I rinsed it and left it out and it went back to the way I found it and you couldn't hardly seen the green at all. I took it over to the local NC Geological Survey and showed it to them ( 4 guys looked at it) and got no definitive answer as to what the green material was. I have repeated the process and it does the same way. I'm not as smart as you folks on minerals, so I don't know what any of the other materials may be. I recognize quartz, feldspar, mica but the black, pink, yellow material I don't know. Will keep you posted, am leaving the vein temporarily to test some gravel where the larger creek has ran in the past, hopefully for gold, rubies, and other gemstones. I am pretty good at identifying corundum, especially ruby and pink sapphire, as well as garnets. If anything different happens on the peg vein will let you know. The thing to keep in mind when identifying minerals is they don't always look like what you might expect in the field guides. Quartz, feldspar and many other minerals can be "contaminated" with impurities to the point where they could defy field identification since they come in a wide range of color shades. Not sure exactly what you have but just something to think about. If you haven't seen these, I thought you might be interested. I'm sure there's a lot more information online. I was thinking the same thing with the green (olivene or epidiote) and black. ( schorl) Surely four guys from the NC Geological Survey would have been able to indentify those. This green is not tourmaline howevere I've found some mostly black or real dark green. Yes there is Olivine & epidote also, this green could be a small amount of olivine in the feldspar. No one yet has been able to answer why it enhances in super iron out and when taken out reverts back to a very dull almost unnoticeable green. http://gemologyonlin...opic.php?t=6996 maybe your Emerald hunch is correct..."